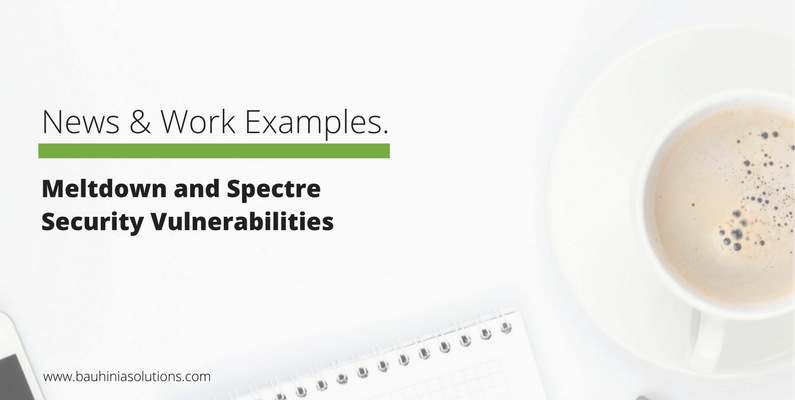 Meltdown and Spectre are two major security issues that threaten nearly all computers and mobile devices. This means your phone, tablet, the server your website lives on, the cloud computer you use to store your data, the old laptop you use when you go away, they are all vulnerable. What these two progams do is steal data which is on your computer. What can you do about Meltdown and Spectre? The are no quick fixes and because these vulnerabilities involve hardware issues, not your standard software issues, the solution is much more difficult to implement. The technology buffs in the know are creating solutions through patches and the best thing for you to do is be actively watching for hardware and software updates. If you receive a notice to update your software for any device, don’t ignore it. Install it immediately. Period. You will need to update your operating systems and your browsers. You will also receive emails from your website host, email provider (if they’re not the same as your host) and any cloud-based systems advising you that they will be updating their servers. This means that your website and online systems will have some down time. It is important to note that as of this moment, you won’t be completely secure, however, if you keep on top of the updates, you know you’ve done what you can do. Hopefully, as research continues on these issues, a complete solution will be found. Until then, keep updating, updating and updating. If you’d like to read more indepth information, I suggest you read the RedHat post, What are Meltdown and Spectre? Here’s what you need to know. Founder and Director, Nicole has been working in the remote support, virtual assistant, outsourcing space since 2007. A professional with multiple certifications, and a specialist in virtual support and ecourse implementation, Nicole is passionate about supporting women-owned businesses in growth and development.